If I was an overdramatic kind of guy, I would say my whole life has been leading up to testing a gaming lap desk. Let me elaborate: I started life as a PC gamer. Some of my earliest memories are of playing games with my dad on his computer, from the terrible DOS Mega Man to Wolfenstein 3D (a nice horrifically violent game for a three-year-old child. Thanks Dad!). My gaming habits would alter when I was six years old and received my first game console, an original PlayStation. In the following years, I became a console gaming devotee. I loved the feeling of laying back into my comfy couch and winding down with my favorite games. Eventually, the convenience of consoles and the dawning of the pricy 3D accelerator card era pushed me away from PC gaming entirely. I lived in console contentment for the next decade or so, until a confluence of factors led to this PC prodigal son returning home; my preference for comfy couch gaming would be catered to by the rising ubiquity of Xbox controller support in games and nifty optimizations for living room gaming like Steam Picture Mode. I put together my first gaming PC and enjoyed a high-fidelity PC gaming experience on my big screen TV, all from the comfort of my sofa. There was one problem with my new PC utopia: some games just undeniably work better with a mouse and keyboard. In shooters, my pitiful twin-stick controller wasn’t doing me a bit of good against the quick precision of my mouse-toting opponents, and games like Civilization or Starcraft were simply unplayable with my setup. 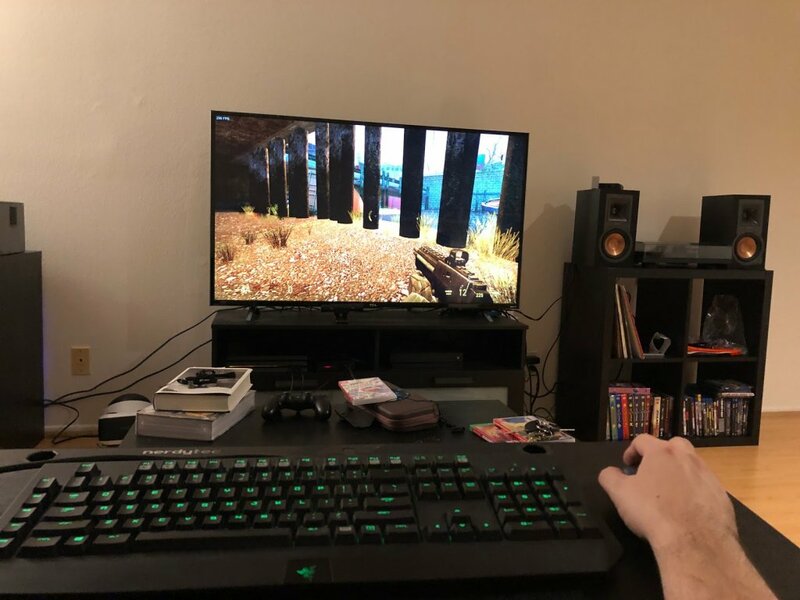 Over time, I reluctantly moved my PC to a desk, complete with a nifty G-Sync monitor, mechanical keyboard and mouse, but I found myself longing for those heady days when I played reclining on my couch. I wished there was some solution that would reunite my faithful PC with my sofa sanctuary while letting me continue using the mouse and keyboard I’ve grown accustomed to using in my favorite games. As if reading my mind and answering my predicament, the Couchmaster Cycon gaming lap desk showed up to the Newegg offices, prepared to transplant my desktop battlestation to my sofa. I eagerly took it home to see if it was the missing link I needed. Gaming desks are a recent development in the gaming accessory space, a natural evolution in the wake of gaming chairs’ stratospheric rise to near-ubiquity in PC gamers’ setups. Gaming desks are positioned as the ideal piece of furniture for a competitive gamer, with many of these desks featuring superior ergonomics, cable management, and mouse-ready surfaces. At the same time, as laptops have supplanted desktops as the form factor of choice for mainstream consumers, lap desks became essential tools for anyone looking to for workspace to place their peripherals and work materials from the comfort of, well, their lap. But up until now, there hasn’t been any major product that brought the unique optimizations of a gaming desk to a lap desk. nerdytec (intentionally lower case “n”), the company behind the Couchmaster product line, set out to upend the very concept of lap desks, creating a piece of kit that keeps your peripherals at your fingertips in a more comfortable and ergonomic form factor compared to competitors’ offerings. Indeed, just one look at a Couchmaster reveals that it’s of a different breed: the Couchmaster is designed for home use, so it eschews portability for a larger surface area and more workspace, and its two large cushions extend off each side, providing upper body support and preventing slouching. The Cycon is nerdytec’s gaming-focused Couchmaster, focused on bringing your wired gaming gear to your lap. It includes an integrated four-port USB 3.0 hub that makes managing your peripherals easy, as you only have to run one five-meter (roughly 16-foot) cable from the PC to the couch. What’s more, the hub does not require a separate power supply, so you won’t have to worry about running another cable to an outlet. Setting up the Cycon was easy, but a little more involved than I expected. There are two panels on the bottom that need to be unscrewed, each exposing their own USB ports, as well a USB type B output for running the included USB A-B cable to your computer. I plugged my mouse into the right side and my keyboard, a Razer Blackwidow on the left, screwing the panels back on when I was done. The fourth USB port is located on the surface of the Couchmaster, which is where I plugged in my headset, a Logitech G430, so I would have the flexibility to remove it when I wanted to hear my games through the speakers connected to my TV. I unscrewed the bottom panels from the base and attached the two cushions. All told it took me around 10-15 minutes to set up the lap desk. I ran a spare HDMI cable from my PC to my TV and was ready to hop into some games. I wanted to make the most of gaming on my 4K TV, so I started off playing a little Half Life 2, a game that I thought would run okay in 4K on my wheezing old GTX 770. While playing a nearly 15-year old game didn’t blow my mind, I had a great time playing with the Couchmaster. The non-slip surface kept my keyboard from shifting around as I played, and my mouse worked well even without a mousepad — although a nerdytec-branded mouse pad is available if you want to complete the look of your gaming lap desk. After the novelty of experiencing Half-Life in 4K wore off, I loaded up a game that I hadn’t already played to death, Fallout: New Vegas, and settled in to play for a little while. The Couchmaster may be comfortable, but it’s still not enough to ease the pain of waiting for Half Life 3. What I thought would be a short test turned into a two-hour gaming session. Part of that came from Fallout: New Vegas being a lot more engrossing than I anticipated, but I wouldn’t have spent so much time if the Couchmaster didn’t feel as natural or comfortable as it does. The Couchmaster Cycon may be focused on gamers, but it’s great for productivity too. I was surprised by how much I enjoyed the experience of working off of my TV screen, and the ergonomic cushions kept me comfortable through long typing sessions. To get particularly meta, I even typed a good portion of this article while connected to my TV using the Couchmaster lap desk. Perhaps the highest compliment I can give the Cycon is that it feels so natural that I forgot it was there as I played: the only time I thought about it was when I peeled myself from my couch and realized that I needed to remove the large desk and cushions from my lap. 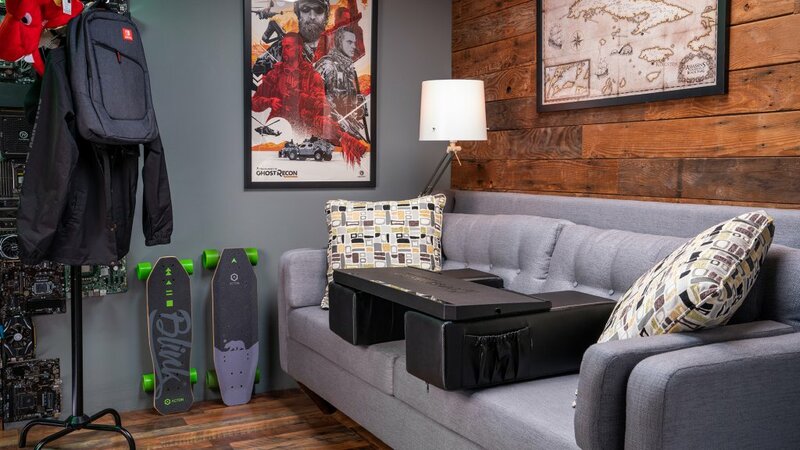 And that ties into the only caveat I can think of about using the Couchmaster Cycon: it’s a bit on the bulky side, and if you live in a small apartment like me, where space is at a premium, then that may be a dealbreaker for you. 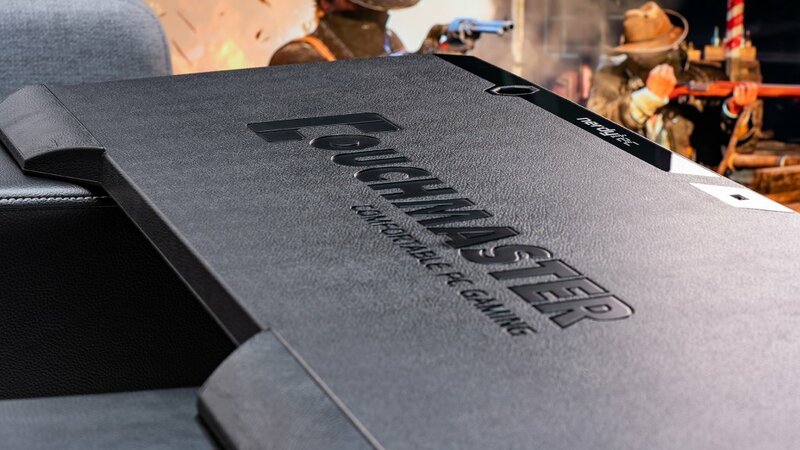 If you have a more spacious home, or a solid storage option, then I can’t think of any reason not to use the Couchmaster if you want to break into living room gaming. Who Says the Living Room is for Consoles? If you want to enjoy the fidelity of PC gaming from the comfort of your cushy sofa (or even your favorite chair, I won’t tell), then using the Couchmaster Cycon is a great way to keep your gaming gear within reach. 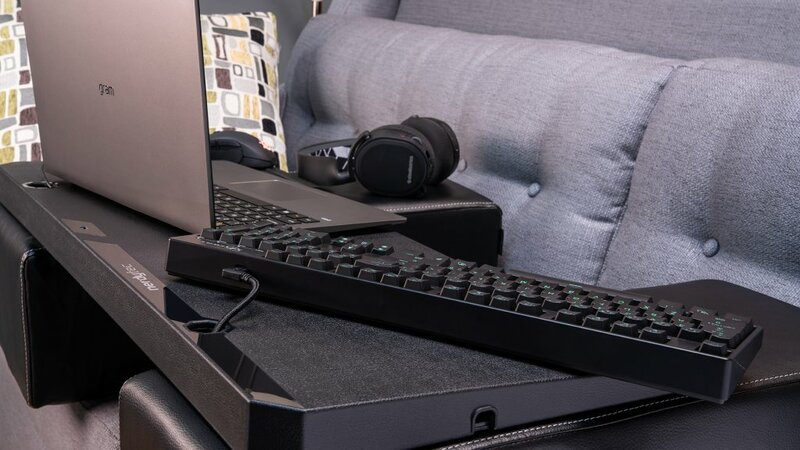 It expertly bridges the gap between desktop and living room gaming with a level of comfort and feature set I have never experienced in a lap desk before. PC gamers, it’s time to take over the living room! 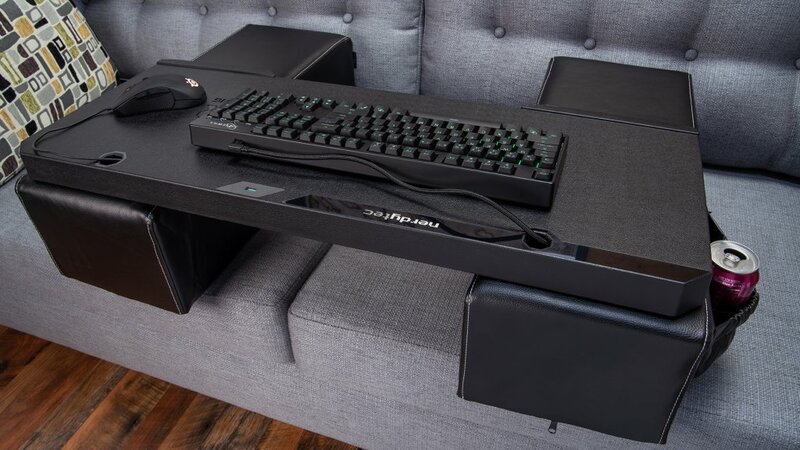 If the idea of combining the comfort of gaming from a couch with a powerful PC intrigues you, then the Couchmaster lap desk is what you've been waiting for. Craig Nieman recently moved to Los Angeles from Cincinnati, Ohio, a city most known for its chili (that only lifelong Cincinnatians think is edible), and professional sports teams who never get past the first round of playoffs. His main hobbies include performing improv and stand-up comedy, gaming, and music. He has an encyclopedic knowledge of video games and The Beatles, and is a superfan of the TV show “Twin Peaks” (upon request, he will gladly send you a 10000 word diatribe about how it was robbed at the Emmy nominations). He is a notorious coffee addict whose hands shake in anticipation of his next cup even as he types this bio. You may recognize him from his appearances at your local karaoke night or if you were one of the 50 people who attended his first, and so far only, improv show. Off to IKEA to build mine for about $30. Seems like a nice product and a reasonable price.